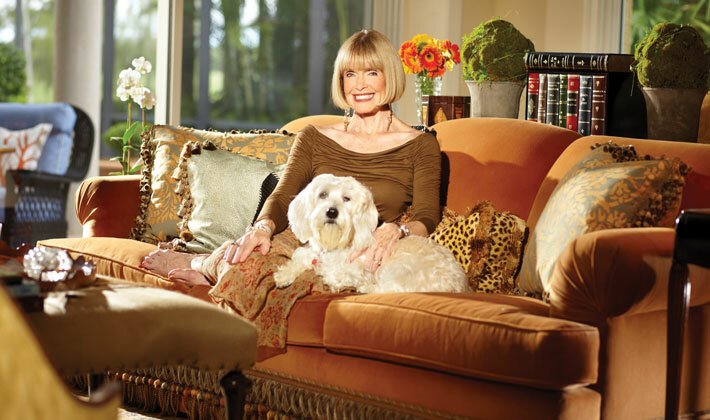 Joan’s passion for interior design began at the early age of 5, when her Uncle Henry, a well-known antique dealer and collector, would take her on weekly trips to the antique shops along Madison Avenue. Afterwards, the two would discuss what they had seen in great detail over tea at the Plaza Hotel. Young Joan was deeply drawn in by the vivid world of furnishings, textures and color. From this inspired beginning, there was no turning back, and Joan’s love affair with interior design continues to this day, now a design icon amongst her peers. Joan’s second passion is her love of dogs. Pictured right is Joan with her beloved Alfred. “I love dogs as if they were people. In my mind, they can do no wrong.” Pictured above (and throughout this biography) is Joan with her current canine love Henry (named after Uncle Henry of course). During our interview, under my water glass, a cream colored napkin embossed in gold with the words “Henry’s Place”. Other major influences on Joan’s work include groundbreaking interior designers such as Sister Parish, who is credited with popularizing the American Country aesthetic in the 1960’s. Known for her unforgiving style, Parish would assess a new client’s space by pushing a tea cart around the room and removing any items that did not meet her approval. Also on Joan’s short list is Elsie De Wolfe, known as “America’s first decorator”. De Wolfe, who took an anti-Victorian approach, was considered America’s first introduction to modernism – using bold, bright stripes and an uncluttered, airy style. 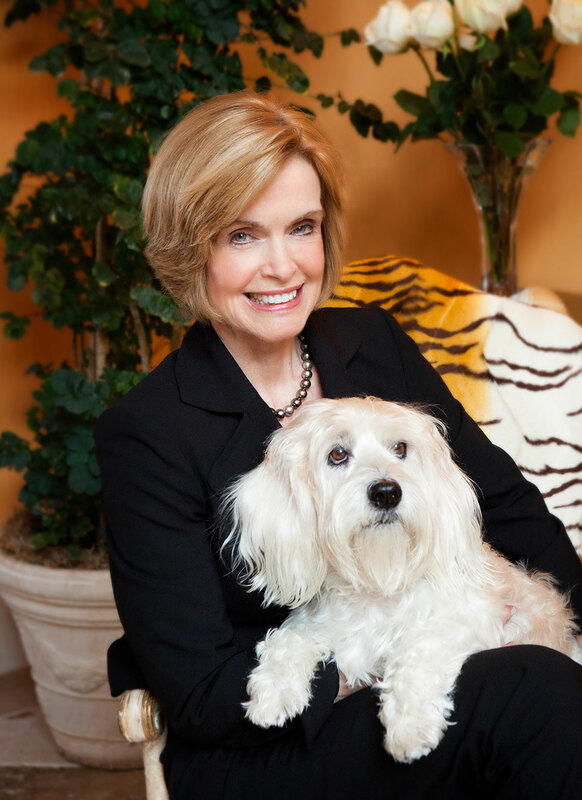 Joan’s second passion is her love of dogs. Pictured right is Joan with her beloved Alfred. “I love dogs as if they were people. In my mind, they can do no wrong.” Pictured above (and throughout this biography) is Joan with her current canine love Henry (named after Uncle Henry of course). During our interview, under my water glass, a cream colored napkin embossed with the words “Henry’s Place”. Joan’s versatility and award-winning design sensibility is demonstrated in her work. No two projects are ever the same. To view some of Joan’s select projects, please visit her Portfolio Page. To read more about Simonsen-Hickok Interiors, please visit the About Us Page.